Direct Inward Dialing (DID), also called Direct Dial-In (DDI) in Europe and Australasia, is a feature offered by telephone companies for use with their customers' PBX systems, whereby the telephone company (telco) allocates a range of numbers all connected to their customer's PBX. As calls are presented to the PBX, the number that the caller dialed is also given, so the PBX can route the call to the desired person or bureau within the organization. "DID" numbers have particular relevance for VoIP communications. In order for people connected to the traditional PSTN to call people connected to VoIP networks, DID numbers from the PSTN network are obtained by the administrators of the VoIP network, and assigned to a gateway in the VoIP network. The gateway will then route calls incoming from the PSTN across the IP network to the appropriate VoIP user. Similarly, calls originating in the VoIP network will appear to users on the PSTN as originating from one of the assigned DID numbers. Carrier1 has local subscribers. 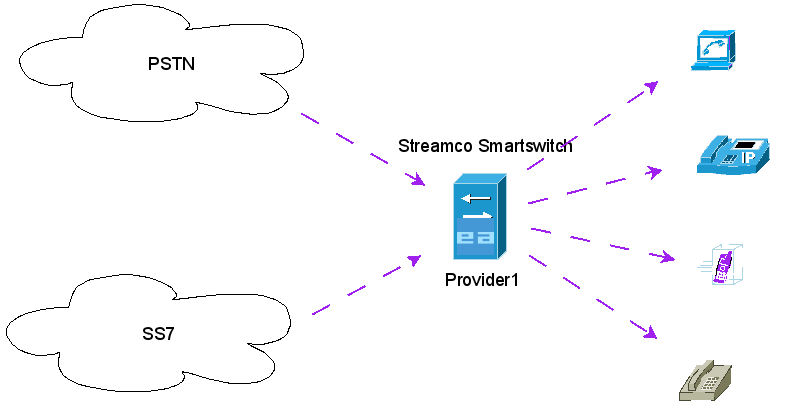 He uses Streamco Smartswitch to implement DID service for his customers. He has signed contacts with PSTN and SS7 providers and has received a pool of numbers, which then are distributed among his local customers.